Born into a family of artists, Andrea Hardy grew up in the world of performers and the stage. Her mother, Grit Hardy, is a trained acrobat and contortionist and her father, Richard Hardy, was a juggler, magician and the founder of the National School of the Peforming Arts in East Berlin. Andrea began her studies in 1974, focusing on juggling and unicycle/high unicycle riding. After her graduation in 1977 Andrea toured throughout Eastern Europe, fascinating her audience with her one-of-a-kind juggling show performed on her high unicycle. After crossing to the west in 1979 Andrea toured Western Europe and the world, captivating her audience with her expertise, wit and charm. 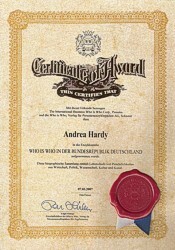 Since 1982 Andrea Hardy has enjoyed the title of being the only professional female Charlie Chaplin impersonater in Europe, the role she celebrates performing for 30 years in 2012. Andrea Hardy continues to expand her repretiore of personas and acts, including Maxi the Clown, ringleader of the Magic Circus Regensburg and Temerarius the Headless. 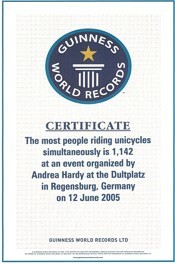 Her many accomplishments include her Guinness World Record in Mass Unicycle Riding (1,142 riders in 2005) and her listing in Who's Who in Germany. National School for the Performing Arts, East Berlin. Main Discipline: Juggling, Unicycles and High-Unicycles.